Does your vibration testing involve products containing electromagnetic relays or motor contactors? If so, there is the possibility that vibration events may cause chatter in your electromagnetic relay. 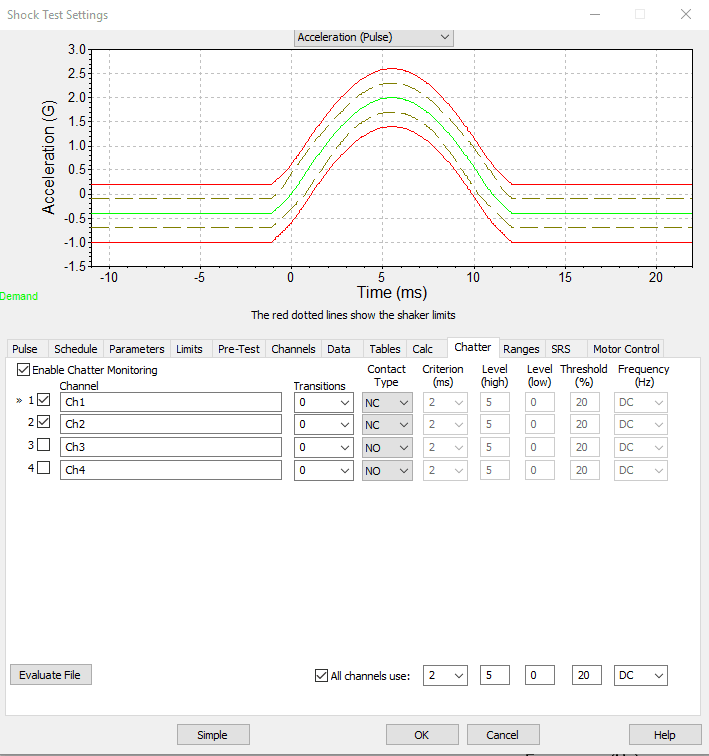 Vibration Research Corporation’s VibrationVIEW software offers a chatter monitoring package that is capable of detecting and measuring chatter events. So whether you are involved in seismic vibration testing of a product containing relays or motor contactors, concerned about possible discontinuities in your relays, or need to evaluate the acceptance criteria for your relays (IEEE 501; ANSI C37.98), Vibration Research’s chatter monitoring capabilities will serve you well. Figure 1: Typical Electromagnetic Relay. The weight on the spring causes the steel plate to make contact with the center contact (Normally Closed). 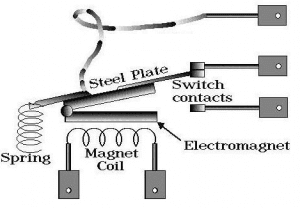 When current flows through the magnetic coil, the electromagnet attracts the steel plate – causing the steel plate to move toward the bottom contact (Normally Open). A generic form of a relay consists of a switch that is operated by an electromagnet (Figure 1). Vibration events or the effects resonance can cause the steel plate to disconnect momentarily from the switch contacts. In the case of a large shock-like vibration (pot-hole; earthquake), the mass on the end of the spring may jerk down and then rebound upwards – momentarily forcing the steel plate to separate from the NC switch contact. Similarly, if the electromagnet is activated and the steel plate is in contact with the NO switch contact, a large vibration may be strong enough to overcome the magnetic attraction between the steel plate and the electromagnet – causing the steel plate to separate momentarily from the NO switch contact. Chatter events can be classified as a discontinuity or bounce. Discontinuity is simply a significant deviation from a monitored parameter. Bounce is an event where the NO contact does not make a secure connection immediately when the electromagnetic coil is energized. If the current draw overloads the contacts when the coil is initially energized, then a perpetual bounce cycle may be started, where there are several moments of contact and loss of contact. This type of chatter event can cause severe damage to the contacts because electrical charge will jump across the short gap between the contacts causing extra wear and damage. Contact bounce is a common problem in motor contactors that are not appropriately sized for the equipment. Chatter caused by vibration is another event that must be evaluated. If the relay or contactor is subjected to a large shock event, like an earthquake, the electromagnetic coil used to hold the contacts in the energized position, and the spring tension used to hold the contacts in the de-energized position must be strong enough to withstand the force of the event. This can be re-created in a laboratory setting by mounting the relay or contactor in its suggested mounting positions, using a shock test or earthquake simulation, and monitoring the state of the contacts. Any change in the voltage for a NC or NO contact will indicate a chatter event. These events can then be evaluated to determine the effectiveness of the contact in the case of an earthquake or other shock event. Vibration Research Corporation’s VibrationVIEW software offers a chatter monitoring package that is capable of detecting chatter events. VibrationVIEW uses the RecorderVIEW package to record the inputs throughout the test. This recording is then evaluated to determine if a chatter event has occurred. At the completion of this evaluation a dialog box will appear that shows each event that was detected, allowing the user to evaluate each event. Upon completion, the user can create a chatter report for each event. Recorded files (.vfw) can also be post-processed using the Chatter Monitoring software. Figure 3: Chatter Monitoring Results for Channels 1 and 2. 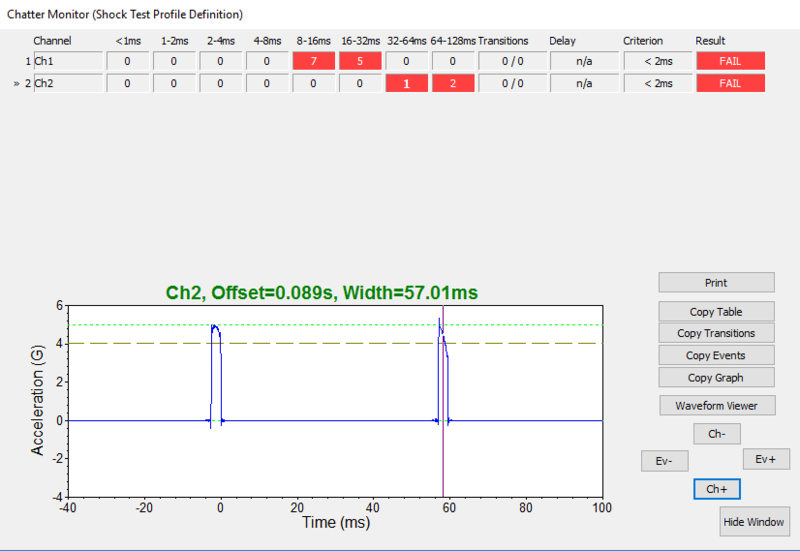 After the file has been analyzed a dialog box will appear showing the chatter events that were detected in the recording, and a “Pass/Fail” evaluation based on the criteria set in the chatter tabs (Figure 2 E) of the test profile. Clicking the Ch + and Ch – will change the channel that is being observed in the graph window, and Ev+ and Ev- will cycle through the events detected (Figure 3). With VR’s VibrationView software and controller, users can detect, measure, and monitor chatter events that may pop up during their vibration tests of their products that utilize relays or motor contactors.